The core of any business is undisputedly its marketing and promotional activities. An excellent marketing strategy can do wonders for your business. Similarly cruddy marketing events can lead to an inefficient business promotion. Businesses use innovative and unique marketing strategies from time to time to stay ahead of their competitors. Marketing as a whole is a wide concept. There are many forms of marketing like media publishing, celebrity endorsement, road shows, etc. One such form of marketing is Influencer Marketing or Influence Marketing. In this form of marketing, the focus is laid on influential people instead of targeting the entire market. Influence marketing is very impactful on the target audience. Market research can be a tedious task for any marketing team or business. Finding the right influencer for your product can be tiresome and time consuming too. While there are dedicated teams in most organizations for research and development, many start-ups may find it difficult to afford the same. 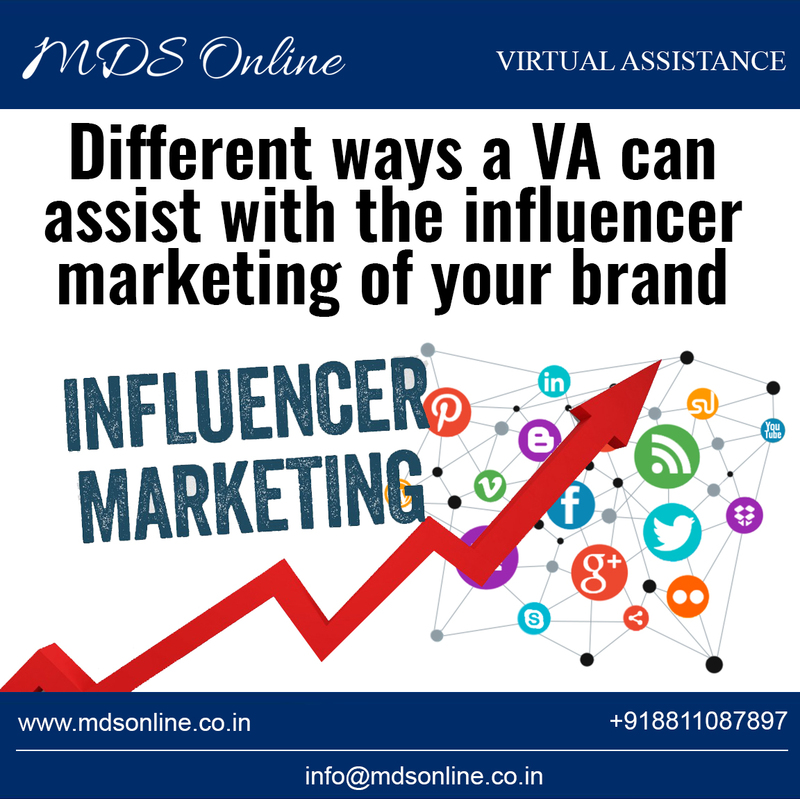 If you or your business has a resource constraint, then you can rely on a virtual assistant to reinforce your activities related to influence marketing. Find your Influencer: There are many influential people in the world. As such, finding the right Influencer for your business is not a tough task, however, it is a very tedious affair. You have to go through and evaluate thousands of profiles to narrow down matched influencer profiles. You can instruct your Virtual Assistant to select profiles that match your business needs and provide you with a comparison sheet of the candidates to make the process easier and faster for you. Cold Calling: There is a huge possibility that the profiles shortlisted in the first step will decline your offer. This reaching out and getting turned down process will also consume a lot of considerable time that you may not be able to allot towards the selection process. Here, you can ask your Virtual assistant to do the cold calling on your behalf and send across your connection request to the influencers. Fixing Appointments: Once you reach out to your prospective influencers, the next step is to have a direct meeting with them. Influencers are bound to be unavailable and preoccupied most of the time as they are one of the most sought after personalities. That is exactly the reason why you want to reach out to them too. You can delegate the job of arranging and fixing up the appointments with the influencers to your Virtual assistant. Impact Monitoring: Now that you have finalized your Influencer, you can engage your Virtual assistant to monitor the impact of your Influencer marketing tactics. This can be done by monitoring website traffic, customer engagement, product acceptance in the market, etc. Influencer Promoting: Engaging the right influencer in your marketing strategy is not the final step. You need to promote your influencer in the right way. You can engage your Virtual Assistant to create promotional contents on your influencer and upcoming events to ensure that your influencer marketing approach gives you the desired results.